After the successful Emotional Rescue weekend with Dzogchen Pönlop Rinpoche at Dalhousie University, Karma Changchub Ling was honored by a visit from Pönlop Rinpoche on Monday, April 18. 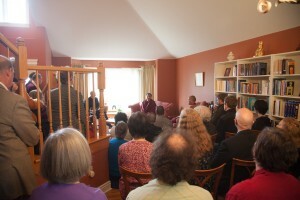 Although this was mainly a “word-of-mouth” event, it attracted an unexpectedly large crowd of members of the various Buddhist groups from the wider Halifax area and other guests. After arriving, Rinpoche briefly addressed those assembled and spoke about the importance of establishing the monastic tradition wherever Buddhism takes roots. 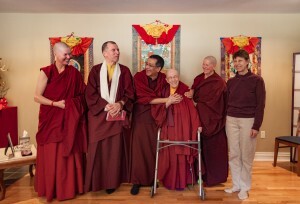 It is one of the missions of KCCL to establish this monastic tradition in working together with those following what Trungpa Rinpoche called the “householder yogic path”. Rinpoche then proceeded to the shrine room where he first performed a general blessing ceremony of the shrine room and KCCL property, and then blessed the recently received Kagyü Lineage tree thangka. This ended the public part of his visit. After a brief break and more good coffee, cake, etc., Rinpoche gave the Kagyü ngöndro transmissions to those who had requested it. 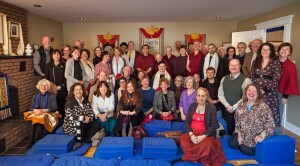 This was witnessed by a large number of “older Vajrayana students”. The ceremony ended by singing the Shambhala anthem. 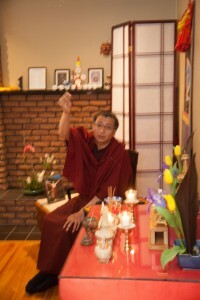 This was followed by several pre-arranged meetings with Rinpoche. 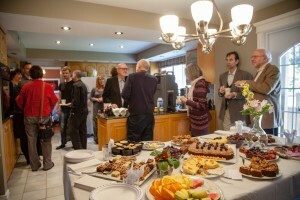 In all, this was a very joyful event, and not just because of the good food! We hope that we can share some of this joy and delight with the photos which Marvin Moore so kindly provided for us. Our thanks go to all those who made this event possible.